Detroit Lions Standout Wide Receiver Nate Burleson is excited to host his 2nd Annual ‘Nate Burleson Celebrity Server Night’ presented by Quicken Loans. This is an exclusive fundraising event for Burleson’s CATCH Foundation at Morton’s Detroit (Troy), located at 888 W. Big Beaver, Ste. 111, on Monday, November 12, 2012 beginning at 7 p.m. 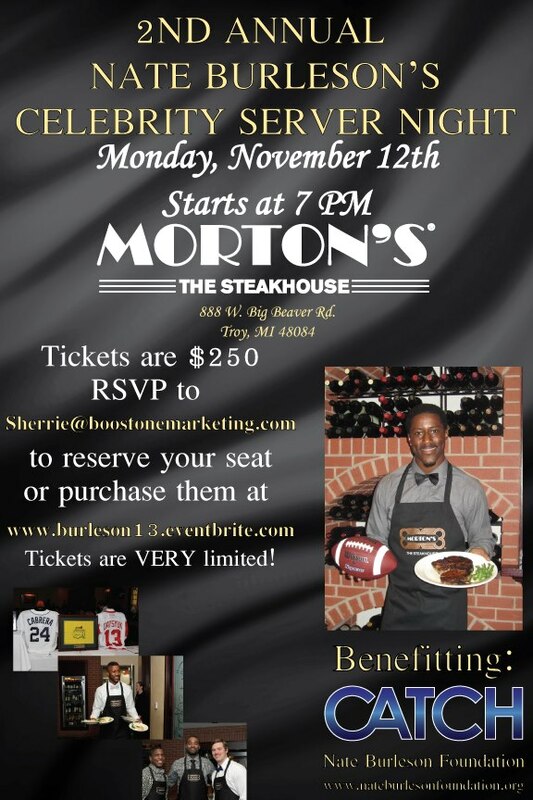 The evening will feature Burleson and many of his Lions teammates trading their pads for aprons and serve a four-course meal to guests for this special evening. Last year’s special servers included Calvin Johnson, Titus Young, Stephan Logan, Rob Sims, Drew Stanton, Maurice Stovall and more of the 2011 Detroit Lions Roster. The event will also include live and silent auctions. The purpose of the Nate Burleson CATCH Foundation, which was started in 2009, is to reach and teach area children and their families by providing them with educational tools to succeed as well as enriching their lives by showing them how to care for others, themselves and their future. Tickets for this exclusive event are $250/ticket (Sponsor tables of 8 are also available) and can be purchased by calling Sherrie Handrinos, Boost 1 Marketing, at 734-341-6859. For more information, please visit, www.nateburlesonfoundation.org.